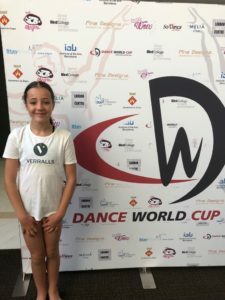 On Sunday 24th June 2018 Katie Bado competed for the Gibraltar National Dance Team in the Dance World Cup sponsored by Verralls . The Dance World Cup was held in Sitges, Barcelona where over 5,800 dancers from across 46 countries competed for the World Dance Championship. Katie’s Formation piece won Gold out of 18 entries and her Group Piece won Silver out of 29 entries in an incredibly high standard competition.